Bobby and Blue Ridge Tradition is an exciting five-piece bluegrass band that plays a unique mix of traditional and not-so-traditional bluegrass music. The band’s style is clearly not your standard run-of-the-mill bluegrass. The band has a knack for developing some great original songs that are built around the group’s sound. 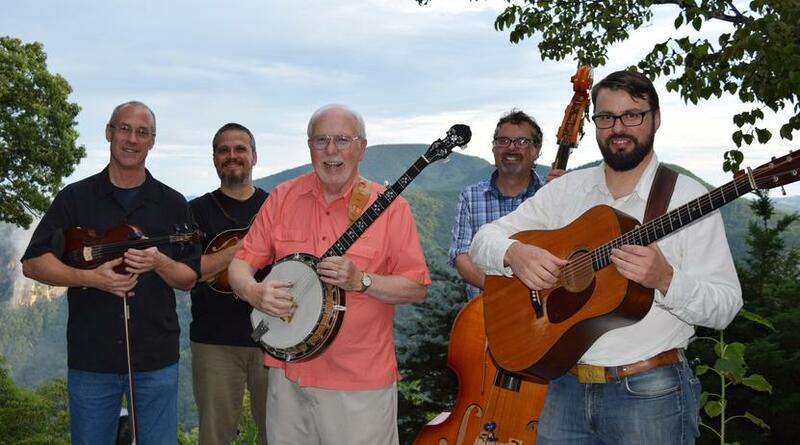 If you’re into the classics, Bobby and Blue Ridge Tradition also performs a heapin’ helping of them, from Bill Monroe to the Stanley Brothers to Flatt & Scruggs, in a style that takes the eternal classic bluegrass sound to the next level. The band is fearless when it comes to crossover material, arranging songs from the likes of Hank Williams, Bob Dylan, Chuck Berry, The Flying Burrito Brothers, The Newgrass Revival and many others into the well-defined framework of the band’s distinct styling, making each song sound like it was written just for them. Bobby and Blue Ridge Tradition offers a wide range of options and is well-suited for many different types of performances. While the band appears at several public venues throughout the year, the bulk of their schedule consists of private parties, weddings, receptions, and corporate events. The primary focus of the band is to entertain audiences, which is without a doubt its greatest strength. If you're planning an event in Western North Carolina that requires some great live music, give Bobby and Blue Ridge Tradition a call. Our level of talent, fun and professionalism is guaranteed to make your event a success. Bobby and Blue Ridge Tradition brought down the house at White Horse Black Mountain. Rarely have I seen a show where the band was as much in touch with the audience. They're welcome here any time. As you know, Bobby and Blue Ridge Tradition had me as a devoted fan since I was charmed by your gospel sounds at Riceville Presbyterian Church in Asheville. As we prepared for our Yee Haw Bar B Que at Wildflower Clubhouse in Franklin, NC, we hoped to include the bluegrass traditions that define the area and continue to be protected and celebrated. We were thrilled to find your website and more thrilled to speak with Jim to confirm your performance at Wildflower. You are each incredibly talented and such a great representation of the voice of the mountains. Your delivery of the Blue Ridge Tradition was the perfect vessel for a wonderful day. What a special time we shared as your music and your joy filled the room and the hearts of our friends. Thank you so much! I just wanted to thank you all again for your participation in our Bluegrass Welcome Celebration. The band was great and everyone had a wonderful evening. The family members from Denmark said they had an experience they will never forget. It was a pleasure to have had your assistance in creating a fun atmosphere and providing some local color. You really made it all come together. I wanted to express my heartfelt thanks to you and the rest of the band for two such wonderful performances during our wedding weekend. You all were fantastic - easy and pleasant to work with, incredibly talented and quite personable. All of our guests really enjoyed your music and both of your performances. As I'm sure you noticed, everyone had a wonderful time at the BBQ, thanks to your tunes. And, I could not have asked for more perfect musical accompaniment to our wedding ceremony. It was what I had always envisioned and the execution was flawless. It was so special to be on the platform having just said our vows and then to hear "Walk Through This World With Me." Your music was truly a beautiful and personal addition to the wedding. Thank you for being such a delight to work with. Please pass along my deepest thanks to the rest of the band for such wonderful performances. You all made our wedding weekend so incredibly special. Best wishes for a wonderful fall! We look forward to seeing you all in Asheville soon! I was fortunate enough to have been visiting South Carolina on business when I heard on the radio that there would be some bluegrass at the Biltmore wine festival over the weekend. I drove on up on Saturday, September 20 and after touring the house and sampling some wine, I was treated to some great old time bluegrass. We sure did enjoy your playing and singing. It was a wonderful unexpected surprise and hands down the highlight of my visit here in the south. Thanks for a great afternoon. Just got home from super show at Feed & Seed. A true "happening". So glad to have been there. Thanks for a 1st rate performance. Hope to see you again soon! Bluegrass music is - simply put - Happy Music! And it just made our day! Katie and Joel's wedding day was so happy and having you play just was the the icing on the cake. We loved you - and the musicians among our guests really appreciated your fine musicianship. We were just amazed and delighted with every single one of the songs you played. We'll never forget Katie and her dad dancing to the Tennessee Waltz. Many thanks for the wonderful music at Rachel and Matt's wedding. It set the tone for the fun evening! The classical pieces were perfect. You got away before I was able to thank you personally, but I certainly did enjoy the music and my friends are still talking about how wonderful you were. I hope to have the opportunity to hear you all again in person sometime. Thanks again for your part in making Rachel and Matt's day special. Just wanted to say I really, really enjoyed hearing you guys play @ my friends wedding on Saturday (Claxton Farm). I took a few pictures that had you guys in there so I thought I would share. Thanks for all the great sounds! Thank you and your group for a very enjoyable performance at our party on Saturday night. I've had many calls from people saying how much they enjoyed the music. I'm sure you wonder if people are listening with all the cocktail chit chat going on, but, I assure you that they are. I understand that some people asked you for your card, so, I hope you will get some further opportunities to perform from the guests recommendations. You never know. At any rate, I just wanted you to know that we enjoyed it. Thank you very much for displaying such beautiful talent. You are all very gifted, thank you for sharing this with everyone. Every time I listen to your albums I find myself singing along and lost in time. That means the world to me. Keep up the good work and music. I look forward to another great album. Excellent. Already have one copy. These two are for friends. The original tunes are great. Carolina Waltz, very beautiful. Can't wait to get up to the Asheville area this summer and hear you live. Thanks for your note. Keep up the fine playing. For booking information or other inquiries, we welcome you to contact us by email at info@blueridgetradition.com or call us at 828-606-5108. We'd like to hear from you! Your information will be kept confidential and will only be used to get back in touch with you. We do not share anyone's personal information with outside parties.